In this showdown we're putting the two main Canadian travel rewards programs head to head. That's Air Miles vs. Aeroplan. Let's see which program gives you more miles for your money and which is better suited to your lifestyle. 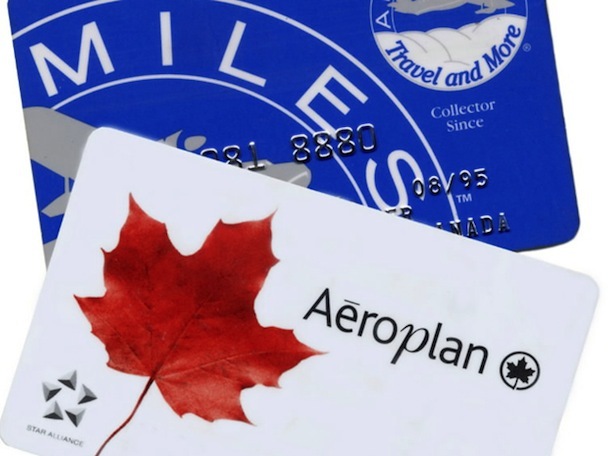 Now that you know all about Canada's Air Miles Reward Program and Canada's Aeroplan Loyalty Program it's time to find out which one is best for you. Use our handy calculator to find out which card gives you more points for your money and take our short quiz to see which program fits with your lifestyle and travel needs. How hard is it to earn? Without a BMO debit card (that let's you earn 1 Air Mile for every $30 you spend) or an Air Miles World Mastercard it's pretty hard to accumulate enough points for anything. If you spend $5,000 on grocery shopping a year and buy all your groceries at Air Miles' sponsor IGA, you would earn 250 miles a year with your Air Miles blue card. With this, it will take you more than four years to earn enough to take a round-trip flight to Toronto from Montreal (and even then you have to pay $200 in additional taxes and fees). You should probably get a BMO Air Miles World Mastercard (that let's you earn 1 Air Mile for every $15 your spend) if you're serious about collecting Air Miles. This premium card even gives you a 25% discount on all Air Miles Flights and up to 40% off select 'Deal of the Week' flights, updated every Monday. If you haven't signed up for the CIBC Aerogold Visa card or one of the AMEX AeroplanPlus cards how will you collect Aeroplan points? Normally you earn 25% of the miles you fly in Economy class (Tango fares). Let's say you are travelling from Toronto to Vancouver. In order to redeem your miles for that same domestic flight you would have to travel an outstanding 24 round-trip flights from YYZ to YVR. Sound doable? As it stands, if you are banking on collecting enough miles to fly you anywhere in the next decade, signing up for one of the credit cards is an absolute must. Just the signing bonus on the CIBC Aerogold card is equivalent to earning points on almost 15 round-trip Toronto to Vancouver flights. If you have quite a few miles and you're not sure what to do with them, let our experts know and they'll show you what's possible.